Technology is becoming a necessary part of our transport experiences. The smart phone allows passengers to check train times, purchase and store tickets and continue to engage on social media. Providing a mobile phone charging infrastructure is a necessity when expecting customers to use their devices for the above. We know that just providing power sockets is no longer enough. "We have worked with ChargeBox for a number of years now and have always been impressed by their service and support. The products are very popular with our customers and look great in our environment. We would have no hesitation in recommending them to other businesses." 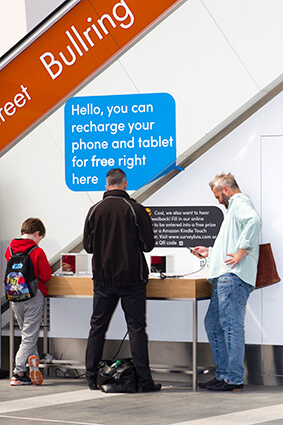 Over the years, ChargeBox have worked with multiple clients within the travel sector but back in August last year we installed 4 of our Charging Tables to a major British Train Station. Since installation the charging solutions have provided over 235,000 charges to their passengers. With travel hubs continuing to find new ways to innovate and enhance the passenger experience, it is becoming more apparent than ever that offering free charging will improve the overall passenger experience within the station.